I love gingerbread – actually, I love anything with ginger in it. And years ago, my friend Cynthia put me onto this amazing recipe called Grandpa Pencil’s Gingerbread Men. Since then, it’s been my go-to for great tasting gingerbread that turns out just how I like it: sweet, gingery, a bit of crunch but mostly chewy in texture. And of course, the kids always love decorating them. The only down-side has been the time it often takes to make and decorate a batch of these lovely things – definitely more a holiday or a weekend thing, than something achievable when life is busy. But I’ve come by two solutions to this problem. The first is these square cookie cutters I recently stumbled upon for $9.95 in a kitchen shop. No more re-rolling excess dough multiple times because the cookie shapes are so awkward. 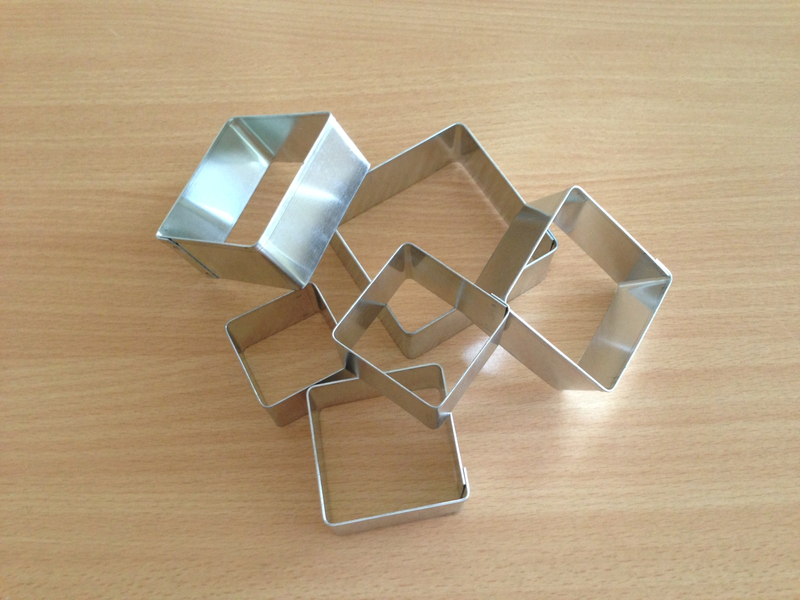 With these square cutters, there’s no need for edges at all, which maximises time by just cutting once. I should say too, as my friend Jane suggested to me: you really don’t need square cookie cutters to treat rolled out dough like this – just use a butter knife and cut the dough into squares in whatever size you prefer. And here’s a tip: the best way I’ve found to lift the uncooked shapes off a floured bench is to use a thin, metal egg lifter. The second gingerbread solution is to cook Grandpa Pencil’s dough as a slice instead of as cookies and decorate with freckles before they go in the oven, which is my adaptation below. Either way, this recipe will cost no more than $3 to make. Thanks Cynthia, for sharing this one all those years ago. Cream butter and sugar. Add the rest of the dry ingredients and mix to combine. With beaters mixing slowly, gently add warmed golden syrup until mixture turns to a ball of dough, not too wet and not too dry. If making into biscuits roll mixture onto a floured bench, otherwise, using wet hands, press mixture into a 30 x 20 cm lined lamington tin. Press 24 freckles into the wet mixture in a 4×5 configuration and bake at 180 degrees (170 if fan-forced) for 45 minutes. If it goes brown on top but still hasn’t cooked through, cover with foil and return to the oven. The end result should be a fudgy/brownie consistency, not so much a crumbly or dry slice. 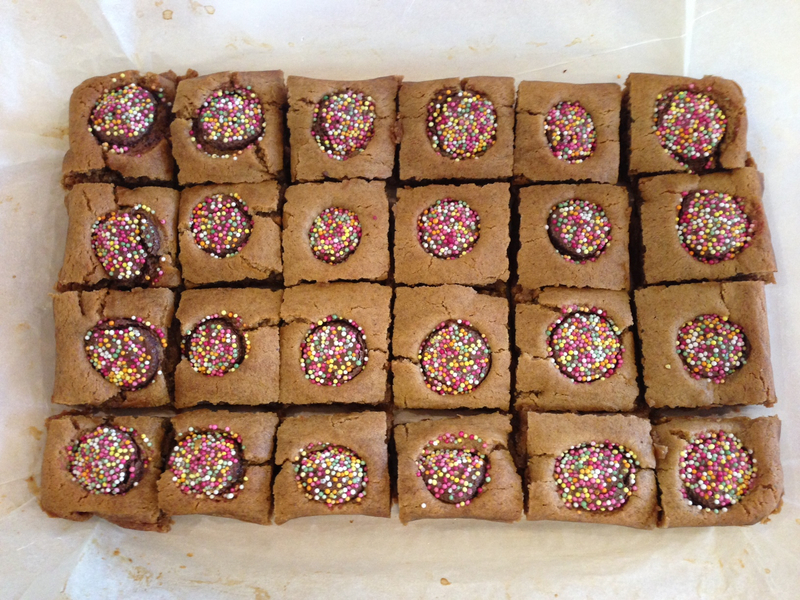 Allow to cool completely in tin before cutting between freckles into 24 squares. Jane, I only discovered your fabulous blog yesterday, but I have already collected so many of your recipes for trying out on the family in the coming weeks! I tried the gingerbread slice today- it’s actually in the oven as I write, but it wondered if the quantities were correct. When I added the warmed golden syrup I had quite a sloppy batter, rather than a ball of dough. Hi Ruth. Thanks for your encouraging response to this project. The mixture is meant to be quite wet, but not sloppy. I’ve checked the quantities in the recipe above with the original and they are correct. I don’t think it will matter much that your batter was a little sloppy – perhaps it will need a little longer to cook through, but I think it would still turn out moist and chewy as it should. Perhaps put in a little less golden syrup next time. Enjoy that slice when it’s done!